removes straws, fibres, burrs, etc., from back of cloth; draws out thick threads of warp and weft, and opens knots by cutting or loosening them by band with needle or burling iron; sometimes also looks over face of cloth, and pushes loose ends and curls to back. combines duties of burler q.v. and of mender q.v. a finisher (hosiery garments) q.v. who specialises in finishing knitted coats. fits coats upon dummies, to examine quality of work, and fit; marks, pins and/or cuts coat, to correct misfit, and repairs with needle and thread or returns coat to dress mender q.v. a hosiery examiner q.v. who inspects knitted hose, and marks faults, together with machine number, for overhaul and adjustment of machine, and for repair of fault. mends rents and tears requiring more delicate work than can be done by mender q.v. ; may draw threads out around tear and reweave threads into the cloth with needle, exactly following the weave pattern. corrects errors in pattern of coloured goods, withdrawing faulty threads and inserting sound threads of desired colour with needle; cf. pattern dresser (winding) (367), pattern dresser (making-up) (943). darns by hand, slits in ground of velvet, fustian, or other similar material, caused by pile-cutting knife. examines finished hosiery goods for any faults in knitting, finishing or trimming; marks fault and returns garment or piece for repair; reports apparent adjustments required in machine. passes bleached or unbleached net over black surface to detect faults, broken or missing threads; passes net in to be mended, where necessary, to white mender or to brown mender q.v. general term covering knot clipper, picker, fringer (419) q.v. and other workers who receive carpet from shearing and brushing machine, examine for defects, clip out knots, mend gaps in pile with needle and wool, sew on fringes to rugs, etc. ; in some factories one skilled worker performs all these operations. inspects knitted garments, remedies minor defects with needle and thread, clips off loose threads, etc., and sews on buttons, tags and belts. a white mender q.v. who works a patch of net into a damaged place, to cover defect. examines printed cloth for defective work, to guard against subsequent claims for faulty printing. a carpet finisher q.v. who cuts, with scissors, knots appearing on surface of finished carpets, caused by knotting together of yarns which have broken in weaving; sometimes also fills in gaps found in pile. operates a machine like a shearing machine, hut with knives more coarsely set, which removes irregularities from surface of cloth before dyeing. examines cloth, as received from weaver, or from bleaching, dyeing, printing, or finishing departments, to detect flaws or uneven patches, usually by pulling it over a roller placed above, and facing, a well-lighted window; reports flaws, etc., to warehouseman, or makes other arrangements for flaws to be rectified, e.g. 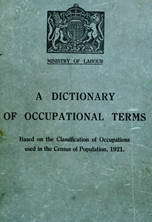 by instructions to mender, dyer, printer; sometimes also notes faults against wage sheet of weaver concerned. examines cloth before it leaves finishing department, to ensure that it is satisfactory as regards colour, width, length, and weight per yard. examines cloth as received in bleaching printing, etc., department, to detect faults which might interfere with bleaching, printing, etc., or might give rise to claims for faulty cloth. examines fustian, velvet, or other cloth after pile has been cut, and, if gashes or holes are found in body of fabric, passes such faulty pieces to ender q.v. for repair. inspects cloth as it comes from loom; reduces to order, threads of warp or of weft dropped by weaver; puts in with needle and thread, threads that are broken or missing, and repairs rents. a net mender or a lace mender q.v. who repairs faults in unbleached plain net or lace, by joining up broken parts with sewing needle; cf. white mender. repairs by band, with needle and thread, defects in knitted fabrics returned from trimming or from coat fitter (knitted coats) q.v. a mender q.v. who mends cloth after it has been through all finishing processes. repairs imperfect lace; often further distinguished according to kind of lace mended, e.g., blond, fancy, point lace mender; sometimes does work of lace examiner q.v. ; sometimes specifically designated, e.g. Honiton mender, sprig mender. mends, by darning or patching, holes or flaws in net; sometimes also does work of examiner (net) q.v. ; cf. brown mender, white mender. repairs, by hand, with needle and thread, defects in knitted fabrics before they arc trimmed, as distinguished from dress mender, who mends hosiery after trimming. see ender (velvet, fustian, etc.). a net mender or a lace mender q.v. who repairs, by hand, flaws in net or lace after bleaching; cf. brown mender, grafter (lace finishing). supervises and checks work of carpet picker q.v. (ii) examines cloth specially to detect grease marks. examines cloth for defects, which he marks with chalk; cloth is then returned to mender q.v. examines material as it comes from loom, and picks off loose threads, hairs, straws, stray fibre and fluff, projecting ends or knots, or other impurities from face of material by hand, or cuts them out with scissors; sometimes also marks defective places for mender q.v. ; cf. burler who works from back of material. a carpet finisher q.v. who examines face of carpet after it has been shorn, and remedies defects with needle and cotton; also clips out knots in yarn. examines cloth after it has been cut and dressed, to see if any weft threads in pile have been missed in cutting process; cuts any such missed threads by hand. examines cloth after it has been dyed, and removes impurities, harsh fibres, etc., which have not properly taken dye. (ii) (cotton doubling) see sorter (cotton doubling). see picker (cord, fustian, velvet). overlooks and repairs damages and missed stitches in embroidery by hand or by machine; cf. Swiss lace machinist (376). examines finished yarn, and picks out faults, sorting according to quality, etc. sorts finished cloth for despatch according to colour, design, etc., and keeps account of cloth passing through his hands. (ii) separates hose of like quality, size and colour, and rejects faulty hose, which is reserved for repair. examines and sorts textile piece goods, either in warehouse, before they are sent to be bleached, dyed, printed, or finished, or in bleaching, dyeing, etc., department, after they have been bleached, dyed, printed, or finished. examines finished yarn, and picks out faults. examines samples of yarn as received from reeling process; hangs hanks of yarn over a hook or bar; notes leasing, and checks counts, as a guide to work done by reelers (367) q.v. ; notes names of defaulters; sometimes also keeps record of work done.